2Grupo de investigación en pediatría del Hospital Universitario Fundación Santa Fé de Bogotá y la Universidad de los Andes (PediAFe). Bogotá D. C., Colombia. 3Departamento de Gastroenterología y Hepatología, Mayo Clinic, Jacksonville, Florida, USA. 4Sección de gastroenterología, hepatología y nutrición pediátrica, Hospital Universitario Fundación Santa Fe de Bogotá (HU-FSFB). Bogotá D.C., Colombia. Cow’s milk protein allergies (CMPA) are the most frequent food allergies in the first year of life. Current evidence about responses to an extensively hydrolyzed serum based formula is insufficient. This study’s objective was to determine clinical outcomes in infants with CMPA to an extensively hydrolyzed serum based formula (Nutrilón Pepti Junior®). This is a retrospective case series study of infants 12 months old or younger diagnosed with CMPA in the outpatient clinic of a pediatric gastroenterology service between January 2011 and October 2015. Information including demographic data, digestive manifestations, time of onset of symptoms, anthropometry and clinical responses to formula was abstracted from a review of clinical histories. Patients’ nutritional statuses at first and one year follow-up consultations were compared using Student’s t-test. Forty infants (42.5% males) whose average age was 3.3 ± 2.4 months were included. Their symptoms included vomiting/regurgitation, colic/irritability and bloody stools. Family and perinatal history related to the development of CMPA included bottle feeding in the first week of life (27 patients, 67.5%), mothers who were thirty years of age or older (33 patients, 82.5%), atopy in two family members (12 patients, 30 %) and cesarean deliveries (30 patients, 75%). Thirty-seven patients (92.5%) responded positively to an extensively hydrolyzed serum based formula while three patients (7.5%) did not respond and required a milk-free amino acid based formula. The first consultation z-score of P/E was -0.69 ± 1.03 while the first consultation z-score of P/T was -0.79 ± 1.00. These improved at the one year follow-up to (p <0.05) P/E: -0.27 ± 0.98 and P/T: -0.14 ± 0.98, respectively. Nutritional recovery and tolerance to cow’s milk was found in a high percentage of infants with CMPA who received an extensively hydrolyzed serum based formula. A double-blind placebo-controlled food challenge is the gold standard for diagnosis of CMA. However, in daily practice an open challenge is used. 23 The CMP is removed for two to four weeks for infants suspected of CMPA. Those fed with formula are given a extensively-hydrolyzed formulas (EHF) and a milk-free diet is prescribed for the lactating mother. Mothers are given a calcium supplement to avoid associated complications. If the infant has CMPA, clinical manifestations disappear. At four weeks after the withdrawal, the challenge is done again through introduction of cow’s milk products to the maternal diet and of formulas based on cow’s milk to the infant’s diet. The reappearance of symptoms suggests, for this study, a diagnosis of CMPA. If patients do not respond to an EHF, an amino acid-based formula (FAA) will be introduced. 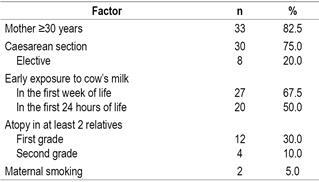 There are no studies in the Colombian population that report responses, acceptability and tolerance to an EHF based on cow’s milk protein (EHF-S) in patients suspected of CMPA. To determine the clinical outcomes of treatment with an EHF-S (Nutrilón Pepti Junior®) in infants (<12 months) with CMPA, attended in the outpatient department of the pediatric gastroenterology section of a reference hospital. A retrospective observational study was made, a series of cases of infants (≤12 months) with symptoms suggestive of CMPA who consulted in the pediatric gastroenterology section of the HU-FSFB between January 2011 and October 2015, in which a challenge was made or open challenge with a EHF based on serum (Nutrilón Pepti Junior®) ± breast milk. For the study, the CMPA was diagnosed with the reappearance of the symptoms for which the patient consulted after the CMP challenge, taking into account that the double-blind, placebo controlled challenge was not performed. Patients with a diagnosis of CMPA who had a minimum clinical follow-up of 3 months after the start of the formula were included. We excluded patients with suspicion or main diagnosis other than CMPA (eg, malabsorption syndrome, metabolic, hepatic, renal diseases, among others). Information from the medical records was collected through the HIS-ISIS® information systems of the HU-FSFB and MEDSYS V4.0® of the Medical Association of the Andes (AMA). The information of: demographic data, digestive manifestations, time of onset of symptoms, anthropometry and clinical response to the formula was registered through a questionnaire consigned in a database in Excel 2010. The nutritional status for the first consultation of pediatric gastroenterology, second consultation and consultation at one year of age were calculated according to the z-score for weight / age; size / age; weight / height and cephalic perimeter (PC) / age with OMS Anthro software version 3.2.2. (2011). Clinical outcomes were defined according to the change in symptom improvement, the difference in nutritional status before and after the intervention, and the acceptability and tolerance to the formula. The statistical analysis was carried out with the STATA Special Edition 11.1 program. Measures of central tendency were calculated for the demographic characteristics of the patients. Student t tests were performed to compare quantitative variables of normal distribution. A value of p <0.05 was considered statistically significant. This study was approved by the Institutional Ethics Committee. A total of 40 infants were diagnosed (42.5% males) with an average age of 3.32 ± 2.37 months with a clinical picture of 1.74 ± 1.50 months of evolution, which were followed in the gastroenterology consultation by 10, 65 ± 6.76 months. The symptoms they presented are summarized in Table 1. The pediatrician suspected CMPA only in 8 (20%) patients. In the other patients, it was diagnosed and treated as GERD in 21 (52.5%) patients; colic / irritability in 7 (17.5%), rectorrhagia in 3 (7.5%) and constipation in 1 (2.5%) patient. As part of the assessment and initial management by pediatrics, 6 (15%) patients had normal coproscopic, 2 (5%) complete blood count with eosinophilia (> 300 total eosinophils) and 2 (5%) anemia. In 3 (7.5%) patients anatomical structural alterations were discarded by an X-ray of the upper digestive tract. 19 (47.5%) patients received therapy with domperidone; 12 (30%) received acid suppressive therapy with proton pump inhibitor (PPI); 8 (20%) received anti-H2 blockers, antacids and probiotics; 4 (10%) received antispasmodic; 3 (7.5%) received polyethylene glycol and simethicone; and one patient received antibiotic and homeopathic medication. Given the diagnostic suspicion, the pediatrician indicated a milk-free diet in 13 (32.5%) patients, 11 (27.5%) received partially hydrolyzed formulas (Comfort®), in 6 (15%) the pediatrician indicated a EHF based on serum and in 1 (2.5%) patient breastfeeding was discontinued. In the case of 7 (17.5%) patients who received partially hydrolyzed formulas (Confort®) or CMP formula, their mothers were ordered a dairy-free diet. In the first assessment by pediatric gastroenterology, 4 (10%) patients had broncho-obstructive syndrome and in the physical examination, 11 (27.5%) patients with atopic dermatitis and 5 (12.5%) with perianal erythema and scab were documented milky The nutritional assessment determined that 5 (12.5%) patients were with moderate acute malnutrition and 9 (22.5%) patients were at risk of acute malnutrition. 1 (2.5%) patient was at risk of overweight. The factors associated with the development of CMPA, in congruence with that described in the literature, are shown in Table 2. Management by pediatric gastroenterology was performed among the following approaches: continue breastfeeding with a maternal diet without CMP supplemented with calcium and EHF-S (Nutrilón Pepti Junior®), exclusive feeding with a EHF-S or passage to an FAA free for lack of response (Table 3). 21 patients who consulted for GERD / vomiting required prokinetics and acid suppressive therapy transiently. Only 5 patients were asked for specific IgE (with negative results), 5 hemograms (3 presented eosinophilia and 2 anemia), 3 anatomical anomalies were discarded by an upper gastrointestinal tract radiography and 1 required an endoscopic procedure. demonstrated eosinophilic proctocolitis. Complementary feeding began at 5.22 ± 0.54 months. 17 (67.5%) patients tolerated the egg and 25 (62.5%) the fish before the first year of life. Additionally, it was determined that 14 (35%) patients underwent atopic dermatitis, 4 (10%) with broncho-obstructive episodes and 3 (7.5%) with allergic rhinitis. The nutritional status of the first gastroenterology consultation (3.3 ± 2.3 months) was compared with the nutritional status at a year of age of 24 patients with the EHF-S and an improvement was found in the subsequent follow-up with the z- Weight / age, weight / height and PC / age score. The change in the z-score for size / age was not statistically significant (Table 4). * p <0.05 (Student’s t-test, paired samples). In the follow-up of 24 patients after one year of age, it was found that 19 (79.2%) patients tolerated CMP between 12 and 17 months, 4 (16.6%) between 18 and 23 months, and 1 (4.2%) patient after 2 years. Current evidence about the response to a serum EHF is insufficient. The findings of this study strengthen the available evidence about the clinical outcomes measured, both in symptom improvement and in the nutritional status of patients treated with a serum-based EHF. Among the main factors associated with the development of CMPA (Table 2), 2 modifiable factors were found: birth by caesarean section and early exposure to CMP. The most frequent reason for consultation was vomiting and regurgitation, followed by colic and irritability. This information is in agreement with that reported in the literature 9,10. However, it reflects how little specific the clinical picture can be, in addition to the short time of evolution of the symptoms, which can make even more challenging the diagnostic suspicion. It is noteworthy that only in 20% of the cases did the pediatrician suspect CMPA, so in the majority of the patients nutritional behaviors not indicated in the management of the CMPA were taken as the change to other formulas containing CMP and even interruption of breastfeeding in 1 patient. As a result, the nutritional behavior was not the most adequate either: a 20% prevalence of therapy with antacid drugs was found, which is not part of the pharmacological management algorithm of the symptoms of CVAA 23. The foregoing makes evident the ignorance about this issue from the field of pediatrics and primary care. Therefore, the development of a clinical practice guide that standardizes the diagnosis and management of CMA in our environment since the patient’s first contact with the health system is made a priority, in order to reduce the burden of morbidity associated with the CMPA. The detailed clinical evaluation in the pediatric gastroenterology clinic made it possible to identify the concomitance of various atopic manifestations such as atopic dermatitis, broncho-obstructive syndromes and allergic rhinitis in up to 25% of patients. This finding is in agreement with what has been described in the literature about the relationship of CMPA with atopic gait in childhood 20. A large percentage of patients reported an improvement in symptoms in the second consultation with pediatric gastroenterology, which occurred in most cases between 30 and 90 days after the start of treatment. During follow-up, 37 of the 40 patients had a positive response to treatment with EHF, understood as the disappearance of the symptoms for which they initially consulted. A statistically significant nutritional recovery was observed in the z-scores of weight / age and weight / height, which supports the relevance and usefulness of this type of formula in the treatment of patients with CMPA. In addition, in economic terms, its cost is much lower compared to a free FAA, which is the next step of treatment if there is persistence of symptoms, as happened with the remaining 3 cases of the total sample. Tolerance to fish and eggs occurred before one year of age in most patients and to CMP before 18 months in more than half of the cases. Although this study demonstrates an adequate clinical response with a serum-based EHF in those infants with suspected CMPA, its retrospective nature does not allow establishing causality. Double-blind controlled clinical trials are required to establish prospectively the causality between exposure to a serum-based EHF and the resolution of symptoms of CMA. The main symptoms of the patients included in this study and for which they consulted were vomiting / GERD, colic / irritability and bloody stools. The main factors associated with the development of CMPA identified in this population were modifiable. A nutritional recovery and tolerance to cow’s milk was found in a high percentage of infants with CMPA who received a serum EHF. The findings of this study are consistent with others described in the world literature.